There’s a misconception that the French don’t eat junk food. While it’s true that the drugstore shelves around here are lined with, of all things—drugs, there are some foods around that don’t quite fall into the high-fallutin’ AOC category elsewhere. It’s become commonplace to see teenagers swilling la Coca from plastic liter jugs on the sidewalks and it’s not unusual to see a Parisian toting a bag from McDo. In the candy department, the dubious Tagada, artificially-flavored strawberry marshmallow domes, I’ve unfortunately had served to me melted on top of a crème brûlée in lieu of a crackly layer of caramel (which was not an improvement, believe me…) and in more upscale desserts in trendy restaurants. Both I found rather unpleasant. 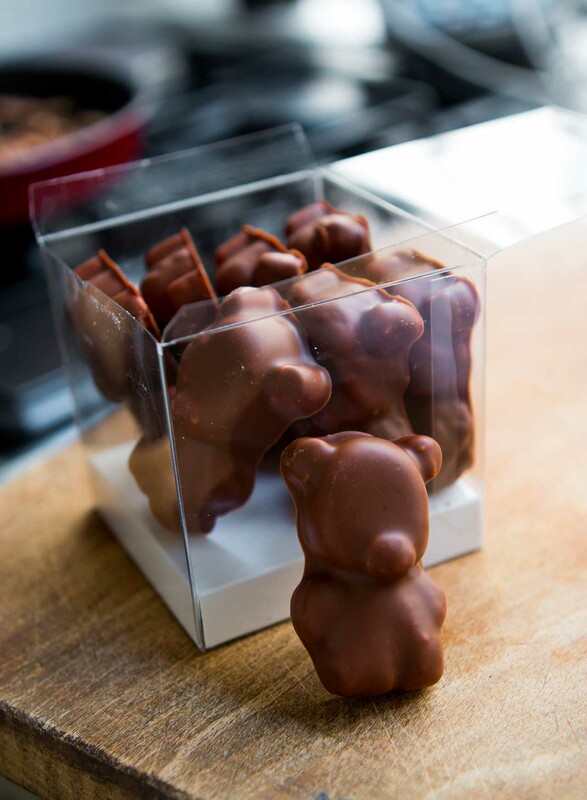 But there is one junk food that I do share their affection for: les oursons guimauve. Admittedly, I’m a sucker for anything made with marshmallows (for example, I love those heavenly toasted coconut-covered marshmallows…and don’t even get me started on Mallomars…), especially if they’re enrobed in chocolate. And another thing that I’ll admit: I’m working on a magazine article for an ice cream riddled with marshmallows and I wanted to use store-bought guimauves. Since almost all of the supermarket-variety marshmallows here in France are tinted a rather unappetizing shade of pink or green, I opted for the ones dipped in chocolate (who could blame me?) and brought home a bag of the oursons guimauve, aka, marshmallow bears, which are sometimes more-cuddly called les nounours à la guimauve, or marshmallow teddy bears. But I’m not worried about that. The only thing that I do worry about is now I need to go back to the store to get more; I snacked my way through half the bag already—and the other half is bound to not last much longer. The best Oursons are from the brand Bouton d’Or. They are very hard to find nowdays. Oh yes! I grew up eating lentils and swiss chard and fish at home but once we hit the streets after school, it was time for junk! “Chuches” like we refer to them in Spain. Lovely! Hmmm…I think I saw chocolate covered “Peeps” one Easter. Similar or too sticky? I recently heard a report… on NPR, I think it was… that France has the largest McDonald’s market outside the U.S.
fabienne: I’m a bit embarrassed to admit this, but mine were from Franprix. But they were really good…and better than some other brands I’ve tried! Sara: Ok…ok, when does the “coffee-for-marshmallows” trade begin? Susan: Peeps, my dear, are beyond compare! I have to admit I rather like those nasty little pink Haribo things. I’d never had them before and when a large plate of them was presented as a sort of bizarre petits fours at a restaurant in Paris I’m ashamed to say that after an initial moment of trepidation I ate the entire plate and was even brought a second one (which I resisted the urge to polish off). FWIW the restaurant is actually rather good (although opinions about the pink things will obviously vary), one of the better places in terms of value for money that I’ve been to in Paris: L’Alchimiste in the 12th. Oh man, these look good. 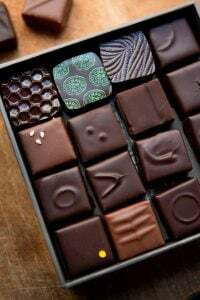 I hope I find some at the NY Chocolate Show today:-) One of my favourite chocolates is marshmallow and caramel enrobed in chocolate. 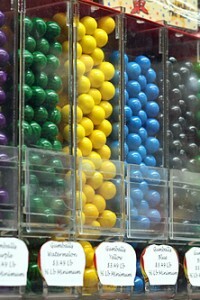 Every damn time you have a picture of candy in the bloglines thingie I say I am not going there! And then I get suckered in. At least this time I found out those are bears. I am on a low carb diet, stop with the confections! Cook some pork. One of my children told me about these, but I’ve never seen them or had them. Yum. Someday I’m going to try to make my own marshmallows. Dipped in chocolate perhaps? for anyone in france (parisbreakfast ?) who is actually craving those franprix nounours à la guimauve, do not go to the store on monday, go sunday, most of the stores are opened on this sunday because tuesday 11th is a holliday. david> have you ever been surprised to find some cracking rice or nuts in those little bears ? I once took a large bag of them that looked normal (not franprix ones) but when i tried one i was disappointed : it wasn’t real ones, but kind of fake ones with a lot of toffee and nuts/rice, much much heavier and chewy. how bad, because what i love most with those bears is how mellow they are, litterally disappearing in the mouth with that slight acidic taste (tartric acid ?) in the end :) . All I can say is that I am now drooling for those little chocolate-covered goodies. I’ll have to satisfy myself with the mint chocolate brownies on my counter in the other room…. Do you remember that we can get Malomars here only around holiday times? I have never understood that — importing the East Coast treat only for Jewish and Christian holy days seems absurd, but there you go. I buy up boxes of them that never last long enough. In grade school in the South we used to eat some sort of nasty graham-cracker pastel-colored marshmallow sandwich cookies that I adored. Glad you have an acceptable junk food there with such an endearing name and nickname! PS By “here” — I meant California. Sorry about leaving out the clue. Since I can’t get my hands on Les Oursons Guimauve I may have to dip the marshmallows I made yesterday (it’s that time of year again) into some good melted chocolate; altho’ I’d rather be in Paris and have what you’re having! Chocolate covered marshmallow rabbits and chocolate covered marshmallow eggs at Easter are my greatest junk candy craving. Do try Valomilks if you can find any. The marshmallow center is softer, gooey-er and denser than a regular marshmallow, and the chocolate coating is thick. Very rich and decadent. I have always been a sucker for See’s Rocky Road, and especially the See’s Rocky Road Easter Eggs. I, too, love anything with chocolate and marshmallows, including Mallomars! I can see why you finished up that bag of French *junk* food. Yum!!! And, how cute are they??? I want some!! I am looking forward to your article. There is a small candy company in New Orleans called Elmer’s Candy http://elmercandy.com/home.htm and they make a candy only at Easter called the Elmer’s Heavenly Hash Egg- it is made up of marshmallow covered in chocolate with a single almond on the top of the egg. I always had these in my Easter basket as a child as did every other New Orleanian child I knew! I didn’t even know that they could only be found locally until I went away to college in Tennessee (I also didn’t realize that Mardi Gras was not a national holiday until probably 3rd or 4th grade!). Anyway- the marshmallow is the most delicious thing in the world- it has these strange sort of crystallized bits of sugar inside- I can’t really explain it- but if you give me an address I could mail them to you when they come out at Easter. I promise that you will find them very different from other marshmallow candies you’ve tried!! Paula: I love See’s candy! I tried to get in there when I was writing my chocolate book, but they wouldn’t let me. They buy their chocolate from Guittard, which is right down the street, and it’s shipped over, still liquid, in tanker trucks! This takes me back to the early 1970s, out shopping with Mum, we would occassionally get a marshmallow bear as a treat. Only the marshmallow here was always orange for the bears. And pink for the chocolate fish. 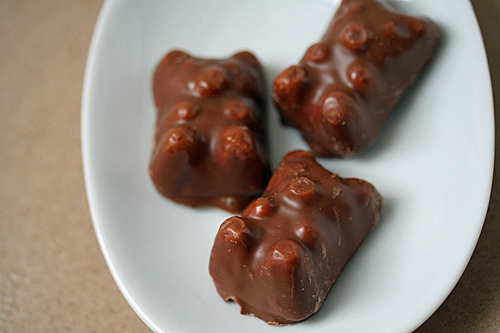 When I first saw this pictures, I thought they were chocolate-covered gummi bears, which I am rather partial too. But I have to agree, covering marshmallows with chocolate is a darn good thing, especially if there is a cuteness factor to it all. There is something so satisfying about ripping off heads with your teeth! I love See’s candy too! I live in the Paris area now, but when I lived in northern California, I used to love See’s Scotch Kisses (marshmallow and caramel), and my all-time favorite was the Scotchmallow (honey marshmallow and caramel covered in chocolate). I always wanted to try their Marshmints, but for some reason you have to special-order them and I never got around to it. I asked the See’s Candy lady why they had to be special ordered, and even she didn’t know! Wow, I would love to dip into a vat of that melted Guittard chocolate (after it has cooled down a bit, of course)! I LOVE toasted coconut marshmallows!! I LOVE those chocolate covered marshmallow twists!! When Passover comes round, I stock up!!! When I moved to California, I learned about See’sand Scotchmallows became my favorite too. I’m living in Besançon, and I’ve never seen these. I have, however, found them at chocolateries and the like. I gotta say, I’m a fan of the Peep. I know, I know. But, I can’t resist. Sadly, I will miss those since I wont be home for Easter. But… maybe they have those here???! Hoo-boy, I’m going to have to try some oursons guimave before I leave Paris! But if it’s really delicious and artfully made, it’s not officially ‘junk’, right? Just a sweet treat. It’s only junk if you stuff a gazillion of them unappreciatively. David, you’re so right, this is my all-time favourite candy, I can’t be trusted near a bag of them. I give them to non-French friends who haven’t yet heard of them to convert them. What I didn’t know was that they got their chocolate from Guittard. No wonder I love Guittard Milk Chocolate so much! I was raised on the stuff, via See’s! As a matter of fact, I rarely make good old fashioned chocolate chip cookies with anything but Guittard Milk Chocolate Chips. Thanks for that bit of fun information. Now I know! Oh, and because of you sweet David, I went out and bought Mallomars last night. I ate three, and loved every gooey bite. I have a huge weakness for anything marshmallow! I’m a sucker for Mallomars, so I know I’d love les oursons guimauve. They look wonderful! Don’t laugh, but I’m also crazy about Hostess Snowballs. Coconut, marshmallow and chocolate cake – what could be better? I’ll have to pick up some of these at Franprix for my kids who aren’t wild about Haribo. Also, just wanted to let you know that I gave a shout out to you today on my blog (not that I have that many readers!) after my experience tasting those Henri Le Roux’s caramels. Now that’s heaven on earth and no junk. I have lived in the US for 20 years and i still dont get the marshmallow thing. Roasted in a campfire yes. Otherwise I just dont get it. Can one of you explain it? In some French cooking magazine this month I saw a charlotte, molded so that instead of ladyfingers or biscuits à la cuillère on the outside, it was a parade of oursons guimauves. It was awfully cute! Eat that horrible chocolate crap! Mmmmmm . . . Peeps! The best ones are the cocoa, hands down! Marshmallowy goodness covered in cocoa sugar . . . I cannot resist! Not exactly gourmet… but we roast the Peeps over an open fire and sometimes, if we’re feeling extra dangerous, we make s’mores out of them. Sooooooo good! Think of your beloved marshies with a caramelized sugar coating. Chocolate covered marshmallows are one of my absolute favorite junky cravings. I come by it honestly, since I still buy Mallomars for my 96 year old father, who can barely gum them at this point but still loves them. There used to be a great German homemade candy purveyor in Yorkville, here in NYC — Elk Candy company. They made, hands-down, the most delicious, very chewy, dark-chocolate-covered handmade marshmallow eggs and bunnies at Easter time. I waited all year for those. Like so many unique small businesses, in NYC, they’re gone — forced out once again by landlords that have no rent limitations for commercial space. Oooh, chocolate and marshmallow–what’s not to love? Oh my gosh! I CANNOT get near a bag of these without devouring the entire thing no matter how many times I tell myself, I am just going to eat 4! Wow, I just have to find a way to make a version of this cake, what a deliciously regressive idea! Oh man I LOVE these! Thanks for reminding me!!! France alone accounts for 13% of all McDonalds sales so why are we surprised? 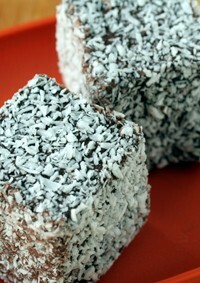 I thought I was the only one who adores toasted coconut covered marshmallows! My Mom literally buys up 3 bags at a time for me whenever she comes across them. Those tiny teddies look delightful too! Any chance they are sold in America? 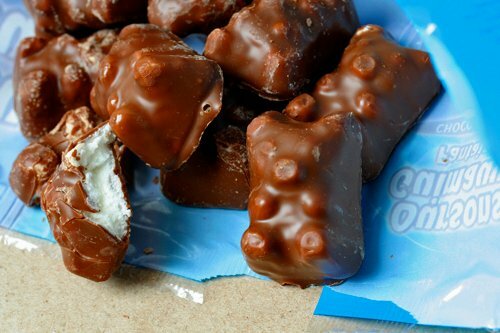 I confess, when I saw the image, my first thought was “Oh wow, chocolate-covered gummy bears!” which I dearly love, but can’t find in shops here anymore. Your little bears there do look tasty, though!